Composed. I’m keeping it simple. When composing a photo I focus on three things. First, I straighten. Typically I try to make sure my shot is straight before I hit the shutter of my camera, but there are times that I don’t have the luxury of lining up a perfect shot. Unless there is a creative reason that I’m wanting a slant for the photo, straight is always better! Second, I crop. Although I do not use Instagram edits, I do use Instagram as a sharing utility, so unless I’m choosing to use an app like squareready , I almost always crop to a square. Often I find I have too many ‘extras’ in my frame, so this is the time to crop them out and focus in on the subject matter. I always do that first crop by eye. Third, I make sure my crop is following the ‘rule of thirds’. Meaning my photo is split into three parts both horizontal and vertical, placing important elements of the photo where the grid intersects. Many times I think I have the perfect crop and then when I examine my thirds, I am sometimes forced to to reconsider shapes and lines that draw my eyes to a specific point. Simple, huh? I approach every edit with the three steps above. And I guarantee that it enhances my photos each time. Since the majority of my work is done on my phone, the Snapseed app is my ‘go to’ for straightening and cropping. I shot the above photo with my iphone 4. It was late morning and there was some natural light peering in through the window. I used a chalkboard as my background and held the grapes in front of it. I had a good eye for this photo, so there was no need to straighten. I knew creatively that I wanted the grapes off to the side, so I cropped accordingly. 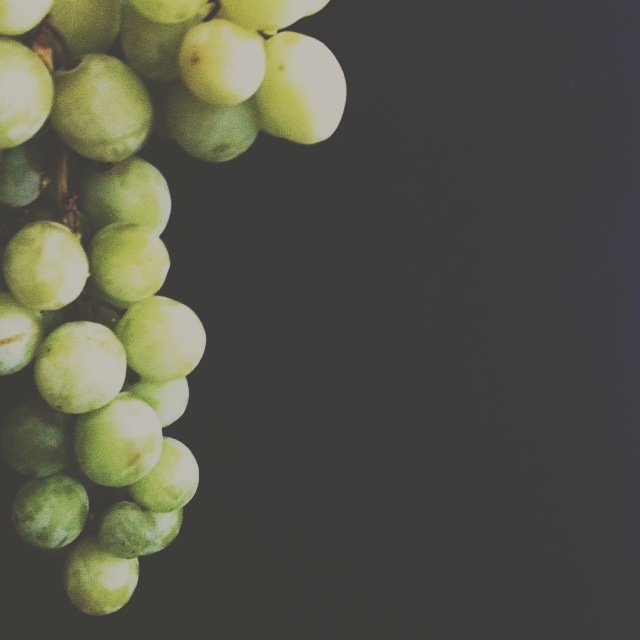 Then using the rule of thirds grid (found on most editing apps), I reexamined the crop making sure the grapes and negative space were lined up correctly. I had to make a small adjustment, causing the crop to be a bit tighter. Once the photo was composed the way I wanted, I finished the edit in VSCO, where I played with contrast, highlights and exposure. So where is Alex? She’s recovering from a major surgery and is looking forward to being able to pick up her camera and blog again in a few weeks. Hoping all of our readers can keep Alex in their thoughts. It’s a bit lonely on the blog without her. Get well soon, Alex! We miss you!